Kent Covington delivers superior results to each and every one of his clients. His educational background in real estate and constant analysis of current market trends sets him far apart from other agents in the Myrtle Beach area. Kent graduated from The University of South Carolina Darla Moore School of Business, with a Bachelor's Degree in Real Estate. This achievement is held by very few active Realtors in the state of South Carolina. If you have questions specific to your property, please feel free to contact Kent today for a free current market evaluation. Kent prides himself in an aggressive approach to marketing, and makes it his goal to help you get your property sold in the best amount of time, with the least amount of hassle. More importantly, we will put the most amount of money in your pocket. 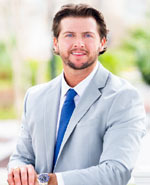 Kent is one of our team of Top Myrtle Beach Realtors!